Explanation: You've probably seen a circle around the Sun before. 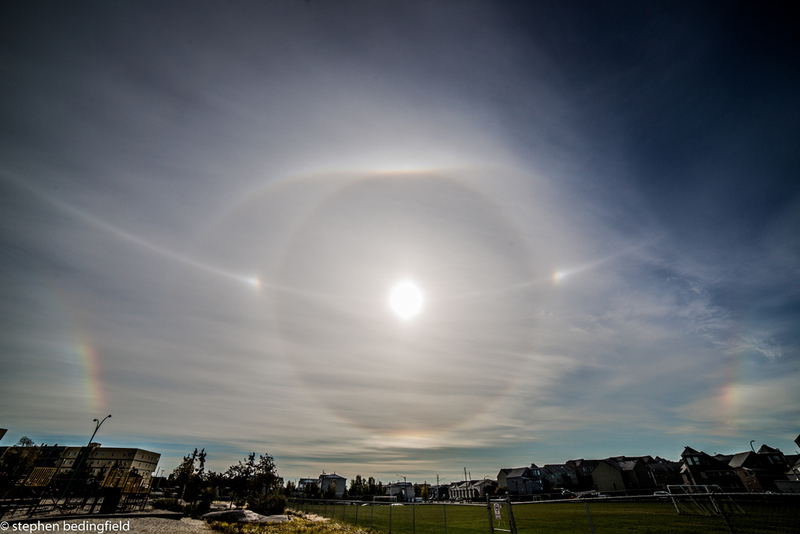 More common than rainbows, ice halos, like a 22 degree circular halo for example, can be easy to spot, especially if you can shade your eyes from direct sunlight. Still it's rare to see such a diverse range of ice halos, including sundogs, tangent, infralateral, and Parry arcs, all found in this snapshot from planet Earth. The picture was quickly taken in the late morning of September 4 from Yellowknife, Northwest Territories, Canada. The beautiful patterns are generated as sunlight (or moonlight) is reflected and refracted in six-sided water ice crystals in Earth's atmosphere. Of course, atmospheric ice halos in the skies of other worlds are likely to be different.